Colleagues and friends of the Wirth Institute at the University of Alberta strongly support the Hungarian Academy of Sciences! 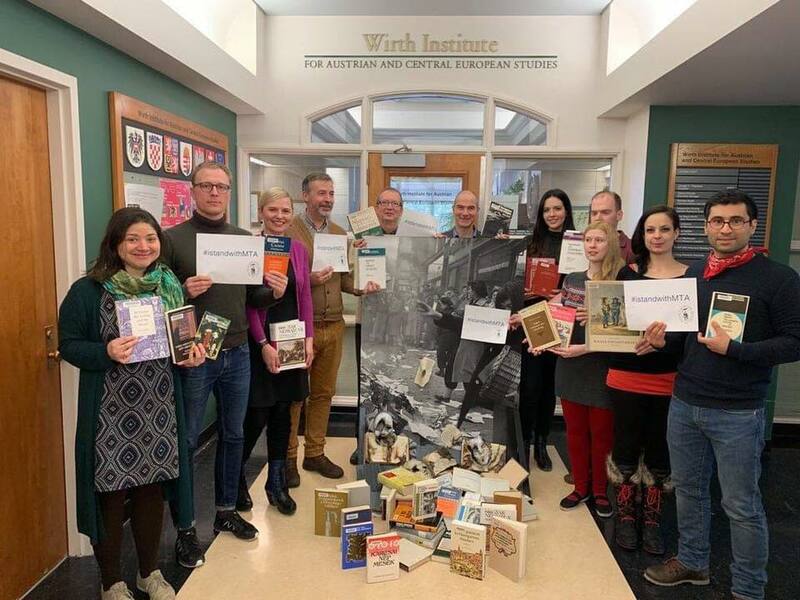 To show their solidarity, members of the Institute in western Canada join the live chain demonstration at the Academy building in Budapest with books published by “Akadémiai Kiadó” from the University of Alberta Libraries. Students, teachers, researchers and people of all backgrounds are protesting in Budapest today (February 12th) against plans by the Junior Minister responsible for education, László Palkovics, to completely restructure research institutes affiliated with the Academy. The restructuring would lead to the elimination of some research units, would further curtail academic freedom in Hungary and would result in an end to their relative independence from direct interference in research projects by the ruling party. Participants at today’s protests in Budapest’s Széchényi István tér were asked by the organizers, Emese Szilágyi and Viktor Lőrincz of the Forum of Academic Workers, to bring with them books that have been meaningful to them and that represent aspects of Hungarian research and academia. Bravo for this show of academic solidarity ! Yes, it is a total disgrace. I am afraid that a sizable portion of the scientists working under the aegis of the Academy of Sciences will move to Western Europe, Canada, or the USA, in order to continue their research careers. Anno-domini January 16, 2019, Liviu Matei writes: “It is the beginning of a reign that is far from over.” On the closure of the CEU. As a normal one, means nothing to do with School, wonders what was before that big bang, why did he write beginning. 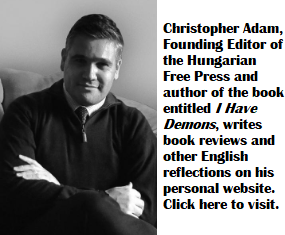 The educationaleatingmonster started years ago, first the schools, the books, the knowledge and then the teacher … and it will continue to eat … until there is nothing left … the Orbán is only available in combat mode. This is only about that idiotic genderstudies isn’t it? NOBODY ON THE PLANET WANTS IT OR NEEDS IT. Perhaps things are orbanised differently in Magyarorszag mate; but usually things like gender studies fits somewhere into sociology, in any event, the Humanies. The Academy of Sciences are concerned with science; you know (or maybe not), things like physics, chemistry, biology, geology, etc. I think the gender studies angle was to do with the CEU. First they came for the “social scientists”, then they came for the real ones; but as one resident galahs on here said, no one has been arrested, so nothing to worry about. Máté, not Gender-studies is the Problem, Máté is the Problem. Academic freedom!!! Sure, why not? A successful model of a functioning institution in Western Society, which we should all demand that it be emulated throughout the world. What, with about half the graduates not benefiting in their career path from their education, but rather having to pay student loans for many years after, while working low-paying jobs, thus not being able to launch themselves in life (founding a family, buy a house). The other half? Mostly brainwashed into the same liberal-globalist ideology, infecting all other institutions, such as media, business, education, politics, government, justice system. The perfect ideological dictatorship model. “… A successful model of a functioning institution …” yes a functioning institution can be Succesful logik, “… in Western Society,…” This is the Problem, Western Society why not only Society? and now the great caretaker speech, we had them in the third Reich. “… The other half? …” “… Mostly brainwashed into the same liberal-globalist ideology, infecting all other institutions, such as media, business, education, politics, government, justice system.